Auto-Lube PLCd 240 | Pro Chem, Inc. 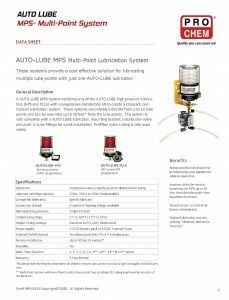 The AUTO-LUBE PLCd is a reusable, electro-mechanical lubricator that is externally powered and programmed using your PLC. Its constant 350 psi lubricant output pressure allows the unit to be direct mounted, remote mounted up to 30 feet away from the lube point or coupled with a progressive distribution block to lubricate from 2 – 12 lube points. This model is available in capacity size of 240 cc and is designed for PLC controlled machinery where a 24VCD power supply is available. 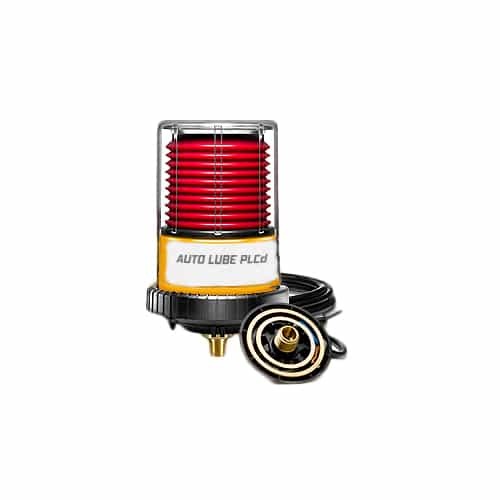 The AUTO-LUBE PLCd/2 lubricator has a unique design utilizing a Power-Through AUTO fitting that contains the electrical connections needed to power the unit. This gives the user the ability to quickly remove the lubricator for fast lubricant cartridge change-out while avoiding disconnecting the electrical connections. A 5-foot extension cable on the Power-Through AUTO fitting is connected to a PLC-controlled power supply. The PLC program controls the frequency of lubrication output cycles by applying a 24 VDC current for at least 5 second and a maximum of 15 seconds for a single lubrication stroke. Turn off the current until the next lubrication cycle is required. If continuous power is applied the unit will cycle every 25 seconds for a total of 10 cycles and then go into sleep mode. To get the 24 V-PLCd/2 lubricator out of sleep mode, shut off the current supply and start the unit again. Further control is provided by adjusting the volume of lubricant ejected on each cycle. A set of 8 special stroke-limiting washers are supplied with each lubricator. When the Power-Through AUTO is used without washers (yielding full piston stroke), the output volume at each stroke is 0.63 cc. For each washer (including the “C”-shaped lock washer) inserted into the brass adapter of the Power-Through AUTO, the output volume is decreased by 0.04 cc per stroke.